Cabin Fever is a Bonus Feature Slot Game, featuring 5 reels, 20 paylines and a special bonus feature of 20 free spins. The jackpot is 50,000 coins. You can bet up to 10 coins per line. The coins ranges in value from 1 cent to 50 cents. There are a total of 38 winning combinations on the 20 paylines. 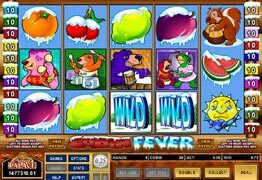 Add to that the wild symbol and the bonus feature of free spins, makes cabin fever slots a game with many oppurtunities to win! To get the free games you have to get a sun symbol on the first and last reels. The suns in return change from sad to happy, and your 20 free games begin. During the free games all of you winning are doubled and you can also win more free games. You get the hightet payout in Cabin Fever Video Slot when you line up the five wild symbols on any of the paylines. When you are betting the 10 coins per line you win 50,000 coins, and if you line up five wild symbols during your free spins then you will win a whopping 100,000 coins!